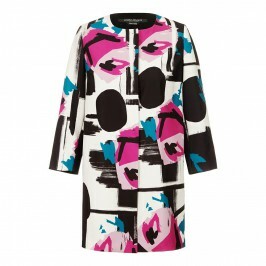 With a graphic rosebud inspired motif and asyemmetrical hem, this Marina Rinaldi tunic is a stylish statement piece. We love the luxuriously silky fabric and flattering elbow length sleeves. Team with tailored trousers for an elegant evening look. Silk tunic top with asymmetric hem. Fabric 1: 100% Silk. Fabric 2: 75% Acetate, 25% Silk. Do not wash in water. Delicate Dry Clean Only.